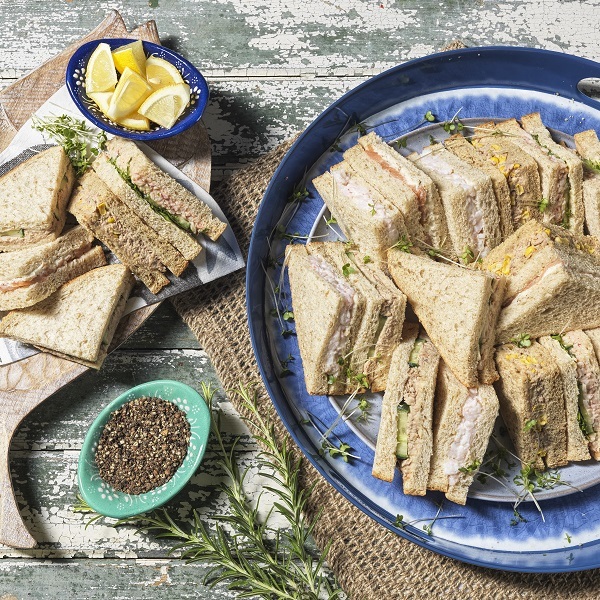 This 20 piece fish sandwich platter includes tuna & cucumber, seafood cocktail, tuna & sweetcorn and prawn mayonnaise sandwiches. Seafood sandwich platter consisting of 8 quarters of tuna cucumber sandwich, 4 quarters of seafood cocktail sandwich, 4 quarters of tuna sweetcorn sandwich and 4 quarters of prawn mayonnaise sandwich. Oatmeal Bread (Fortified Wheat Flour (Wheat Flour, Calcium Carbonate, Iron, Niacin, Thiamin),Water, Oatmeal, Wheat Bran, Yeast, Salt, Wheat Gluten, Spirit Vinegar, Emulsifiers: Mono- and Diglycerides of Fatty Acids, Mono- and Diacetyl Tartaric Acid Esters of Monoand Diglycerides of Fatty Acids; Rapeseed Oil, Malted Barley Flour, Palm Oil, Flour Treatment Agent: Ascorbic Acid; PalmFat, Wheat Starch), Seafood Cocktail Mix (Prawns (37%) Prawns (Pandalus borealis, Pandalus jordani) (Crustacean), Water, Salt), Surimi (37%) (Fish meat (Alaska Pollock (Theragra chalcogramma) (Fish), Hake (Merluccius productus) (Fish), Hoki (Macruronus magellanicus) (Fish), Sugar),Water, Wheat Starch, Free Range Egg White, Rapeseed Oil, Sugar, Salt, Natural Flavouring, Flavouring: Shrimp Extract (Crustacean)), Colour: Lycopene),Water, Rapeseed Oil, Sugar, Tomato Paste, Cornflour, Spirit Vinegar, Salt, Pasteurised Free Range Egg Yolk, Pasteurised Free Range Whole Egg, Dextrose, Concentrated Lemon Juice, Chilli Powder, White Pepper, Mustard Seeds, Black Pepper, Garlic Powder), Cucumber (13%), Lettuce (7%), Butter (Cows' Milk). Oatmeal Bread (Fortified Wheat Flour (Wheat Flour, Calcium Carbonate, Iron, Niacin, Thiamin),Water, Oatmeal, Wheat Bran, Yeast, Salt, Wheat Gluten, Spirit Vinegar, Emulsifiers: Mono- and Diglycerides of Fatty Acids, Mono- and Diacetyl Tartaric Acid Esters of Monoand Diglycerides of Fatty Acids; Rapeseed Oil, Malted Barley Flour, Palm Oil, Flour Treatment Agent: Ascorbic Acid; PalmFat, Wheat Starch), Tuna (23%) (Skipjack Tuna (Katsuwonus pelamis) (Fish), Water, Salt), Cucumber (20%), Black Peppermayonnaise (12%) (Water, Rapeseed Oil, Cornflour, Spirit Vinegar, Pasteurised Free Range Egg Yolk, Salt, Sugar, White Wine Vinegar, Black Pepper, Sucrose, Concentrated Lemon Juice, Thickener: Pectin; Black Mustard Seeds). Malted Bread (Fortified Wheat Flour (Wheat Flour, Calcium Carbonate, Iron, Niacin, Thiamin),Water, Malted Wheat Flakes, Wheat Bran, Wheat Gluten, Yeast, Salt, Malted Barley Flour, Emulsifiers: Mono- and Diglycerides of Fatty Acids, Mono- and Diacetyl Tartaric Acid Esters of Mono- and Diglycerides of Fatty Acids; Spirit Vinegar, Malted Wheat Flour, Rapeseed Oil, Flour Treatment Agent: Ascorbic Acid; Palm Fat, Palm Oil, Wheat Starch), Skipjack Tuna (27%) (Skipjack Tuna (Katsuwonus pelamis) (Fish), Water, Salt), Sweetcorn (17%) (Sweetcorn,Water, Sugar, Salt), Water, Rapeseed Oil, Cornflour, Spirit Vinegar, Pasteurised Free Range Egg Yolk, Pasteurised Free Range Whole Egg, Black Pepper, Salt, Concentrated Lemon Juice, Mustard Seeds. Produced in the UK using tuna caught in the Indian Ocean and fish and prawns from the Pacific and Atlantic Oceans.